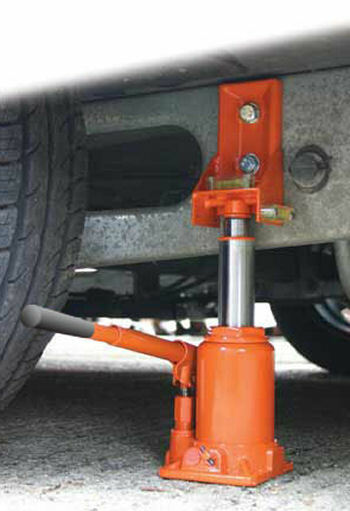 Last week we talked about basic concepts of fluid statics, using the example of a hydraulic jack. This week we’ll continue talking about fluid statics and explore another example. Let’s say you have a 10 foot deep swimming pool and you want to know what the water pressure is at its bottom. Your common sense may tell you that that pressure can be measured by examining the weight of the water itself, and you would be partially correct. But there is another factor that you may not have considered to be significant to the calculation. At this point let me pose a question. How do we breathe? Your answer is directly related to measuring that pressure at the bottom of the pool. You see, contrary to popular belief, air is not weightless, and because it has weight it impacts objects, creating an external pressure. This pressure is known as atmospheric, or barometric, pressure. 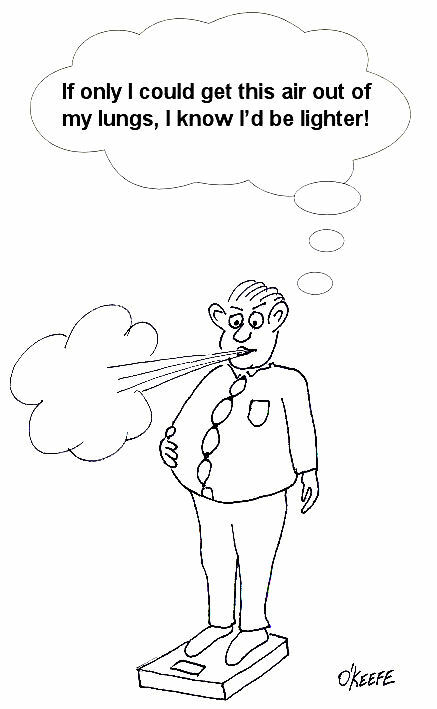 When you breathe, your diaphragm, which is moved by a muscle, allows the lung cavities to expand or contract accordingly. When the diaphragm is lowered the lung cavities are increased in volume, allowing the atmospheric pressure of your surroundings to come rushing in to fill the space that has been created. Along those lines, it was discovered some time ago that in order to determine the pressure at a given point within a body of water, we must consider not only the depth of the water itself, but also the atmosphere that is above it, bearing down on it. This is illustrated in Figure 1. Now, it’s known that atmospheric pressure at sea level is about 14.7 pounds per square inch. So let’s say that this is the pressure being exerted on the surface of the water in our example by the weight of the air above it. where “psi” is an abbreviation for pounds per square inch. Notice how the pressure at the bottom of the pool doesn’t depend on how wide or long the pool is? It only depends on its depth. This means the deeper into a body of water that you go, the more water weight will be bearing down upon you, that is to say, the water pressure increases. This is why submarine hulls have a propensity to collapse if they dive too deep. The pressure from the water above gets to be too great compared to the air pressure inside the submarine, and the metal of its hull stresses to the breaking point. It’s like squeezing an egg in your hand. This wraps things up for the topic of fluid statics. Next week we’ll continue with our fluid mechanics series and talk about fluid dynamics. This area of fluid mechanics involves fluids that move, like water moving through pipes and air flowing over airplane wings. Last week we talked about psychrometry, which involves the analysis of gas and vapor mixtures like air and water. This week we’ll begin our discussion of fluid mechanics, which is the study of the force, pressure, and energy on both stationary and moving fluids. We’ll focus on stationary fluids this week. Let’s clear one thing up before we go any further. By “fluid,” I mean a substance that deforms continuously under a shearing stress, no matter how small. That means that when you try to cut it with a knife, a fluid just gives way under the knife and comes back together again after the knife passes through it. Remember the T-1000 liquid metal man in the movie Terminator II? Now that’s what I’m talking about! Now we all know that liquids are fluids, but did you know that gases are, too? An important concept in fluid mechanics is that liquids, like water and oil, cannot be compressed much when you push down on them in an enclosed container. This is because the molecules of liquids are tightly packed together and they can’t squeeze together any tighter. So, liquids are considered to be incompressible fluids. On the other hand, when you push down on a gas, take air for example, you can compress it within the container. This is because the gas molecules are far apart from each other, so there is plenty of room for them to come closer together. Since there is so much room between their molecules, gases are considered to be compressible fluids. Let’s begin our exploration of fluid mechanics by examining fluids that don’t move, meaning they are static. This field is also known as the study of fluid statics, otherwise known as hydrostatics. We’ll talk about fluids that move, that is, fluid dynamics, later in our series. 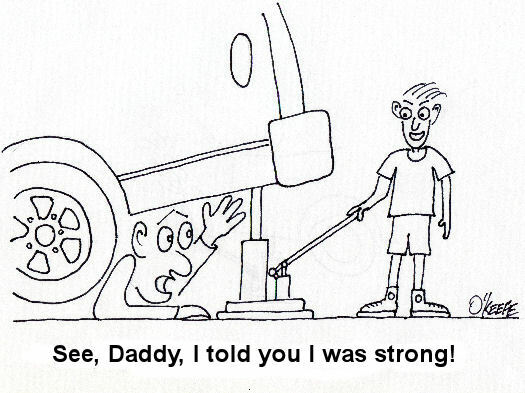 To show how fluid statics works, suppose you have a hydraulic bottle jack in your garage like the one in Figure 1. When you push down on the lever, it doesn’t take a whole lot of muscle to lift something heavy like a car. Why is that? Let’s see how the jack works by looking at a cutaway diagram. See Figure 2. The jack basically consists of two cylinders, one small, one large. The two cylinders are each filled with oil, and there is a passage between them. Inside each cylinder is a piston. The oil in the jack is a liquid, so it’s incompressible. 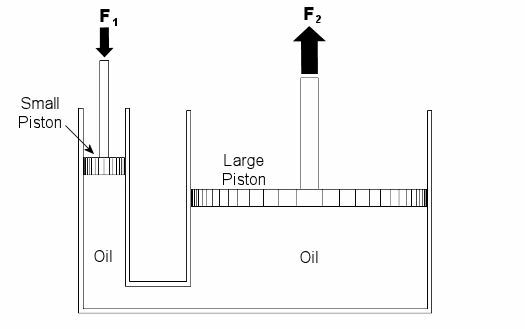 When you push down on the jack’s lever, you create a force, F1, on the small piston. This then creates equal pressure in the oil under both the small and large pistons. Why? Because the liquid molecules are so tightly packed together, they push against each other and pressure is transmitted equally on all surfaces inside the jack. Now “pressure” is simply a force divided by a unit of area, for example, pounds of force per square inch. In our example it’s the large piston that’s going to lift the weight of the car. Because the large piston has a much larger surface area than the small piston, the fluid in the large cylinder will create a much larger force, F2, to bear up against the car’s weight, thereby lifting it off the ground. So what’s happened here? Well, like magic, the jack uses fluid statics to multiply the input force by a factor of ten. When you push down on the jack handle with 50 pounds of force, you actually produce 500 pounds of force, enough to lift the car. If you made the large piston wider, then its area would be much greater still. For example, if we doubled the size of the large piston from 20 square inches to 40 square inches, F2 would be doubled, so you’d end up with 1000 pounds of force, more than enough to lift an oversized vehicle, like an SUV. Miraculously, the force used to push down on the small piston would remain the same, so there’s no need to worry if you’re a 100-pound weakling. Next week we’ll continue with Part II of our discussion of Fluid Mechanics and talk further about fluid statics.